We ship on Mondays, Tuesdays and Wednesdays using either the USPS or FedEx for our ground shipping that is included in our item pricing. Most ground shipping arrives in 2 to 3 days, and can take up to 4 days if your location is further away. Express shipping is available for an additional fee. Currently we are shipping within the Continental United States. Deliveries can be expected from Tuesday through Saturday. When ordering, you are selecting your shipping day, not your delivery day! Orders received before 10 AM (CST) will ship that day, unless you select a future shipping date. We offer USPS, FedEx Ground and Express Shipping. Remember that your delivery day will be impacted when USPS and FedEx are closed for holidays. You will be able to calculate your shipping cost before checking out. We are not responsible for incorrect delivery addresses. If you select USPS you can deliver to a PO Box, but the delivery day is not guaranteed. If you select FedEx Ground (Ground only) they will deliver on Saturdays, but they will not delivery to a PO Box. The ground service is not guaranteed but is usually on schedule 99% of the time. Fedex Express shipping is guaranteed delivery. 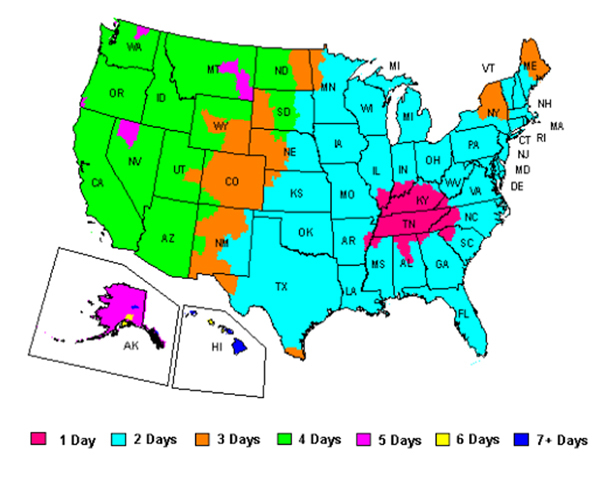 The map below represents the "FedEx Ground" delivery days to your location. We are a small-batch limited production artisanal bakery. We sell out, so order early!